When I was in kindergarten, we had a lesson about "winter birds". For some reason, I vividly remember this lesson. We were told how most birds migrate south when the winter comes, but that some birds stay behind and know how to find food even in the snow. 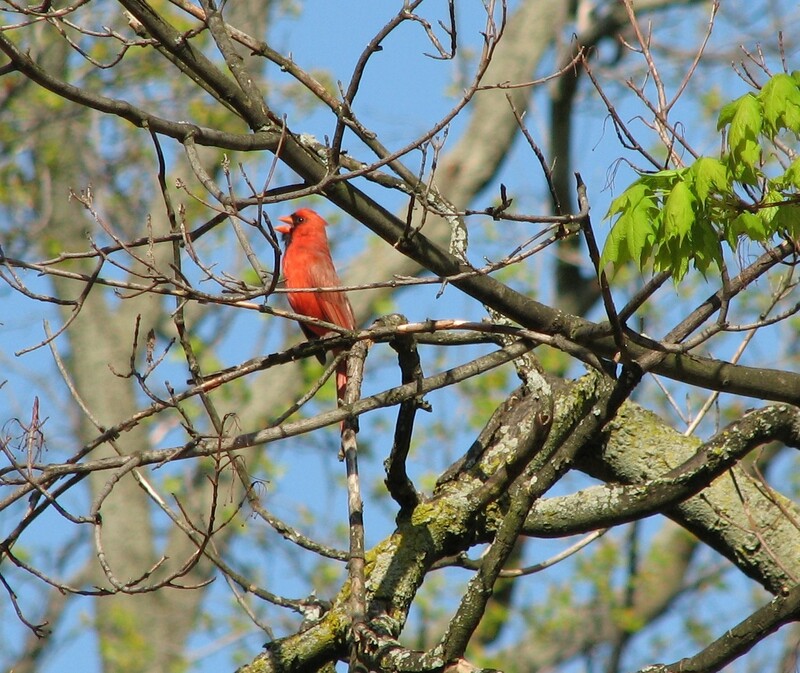 The three birds they told us about were cardinals, bluejays, and chickadees. I remember being fascinated by the blue and red birds, especially. I fervently wished that I would one day see them. A few years later, I remember standing in our small kitchen in our rented second floor flat, looking down at our landlord's backyard, where they had a large pear tree. I saw a sudden flash of blue. 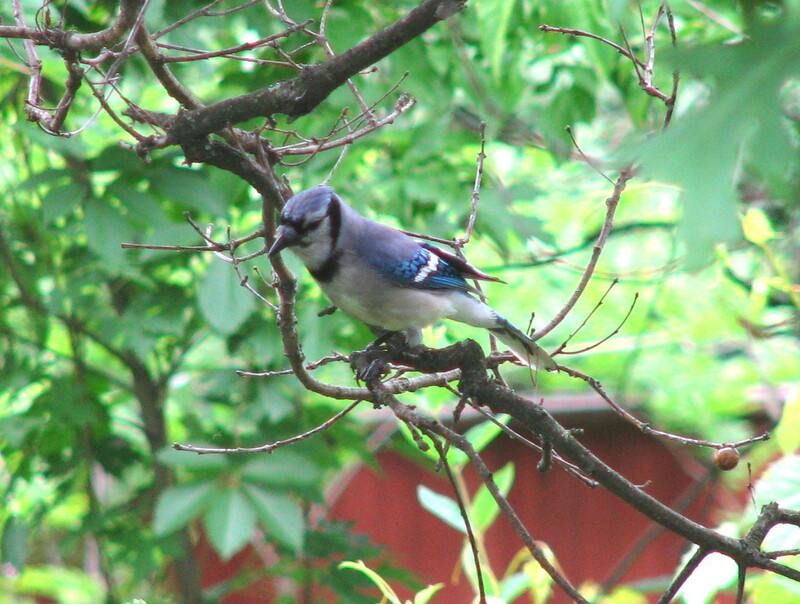 "It's a bluejay!" I remember telling my mother, without taking my eyes off it. I watched as it hopped around the tree for a few seconds, and then left. My fascination with birds would only be re-awakened much later in life, though. I don't remember the very first time I saw a cardinal, but the earliest one I can remember, I was in my very early years of university. I was taking a solitary walk through the snowy woods surrounding Black Creek near York University, and the sudden appearance of that bright red bird amidst the grey surroundings took my breath away. I was used to tramping around in the woods during the spring and summer, but that day was my first winter walk. I was impressed by the silence of the woods, despite the infinity of falling snowflakes. But most of all I was impressed by the bright red apparition that could survive in this frigid cold and look so beautiful doing so. A few years later, I was on another university campus, exploring the woodlots with my camera. I didn't know it at the time, but it was peak spring migration season, and the woods were full of fascinating little birds that were just passing through for those few weeks. I photographed what I could capture, and looked them up later. I was especially taken by a little yellow fellow who I would later find out was a yellow warbler. I was amazed by his brightness. 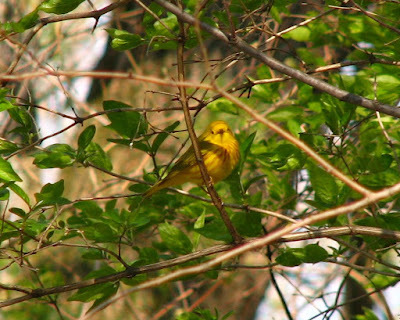 It was this little yellow bird that fully reignited the spark that had been lit back in kindergarten, and I fell in love with every bird I saw, slowly learning their mannerisms, their migration patterns, their flight patterns, their songs, and their unique quirks. Several years later, and with many bird ID's now under my belt, I began to acquire a list of particular birds that I really wanted to see. The Baltimore Oriole was one of them. This beautifully bright orange bird called to me from the pages of bird field guides. Just like the brilliant blue of my first bluejay, the surprising red of every cardinal, and the delightful yellow of the yellow warbler, I longed to experience the glowing orange of this elusive (to me) bird. It happened at Point Pelee, an important site in Ontario for bird migration. I was walking with someone, and I still remember the thrill, the breath caught in my throat, when all of a sudden, a flash of bright orange appeared amidst the emerging green buds on the trees. We stood still and watched the lovely orange fly around for a bit before it headed out of our sight. It was a perfect day. A long awaited for occurrence, finally ingrained in my memory. Later that day, I ended up having my heart broken. As I grappled with the news that had been revealed to me, my thoughts kept going back to that bright orange. The beautiful apparition now seemed tainted, something that I wanted to forget. How could something so profoundly beautiful be paired with something impossibly sad? The person I was with struggled to reassure me that the two things need not be paired, that I could still have my beautiful orange memory. I was not convinced. It was many years before seeing an Oriole would bring me joy. The sight of one was often bittersweet, still tinged with the broken feelings from so many years ago. Eventually, though, time did its magic, and I mostly forgot about the sadness. Orioles just became another fascinating bird that would colourfuly appear every spring. Every year, the return of the Oriole is always exciting. It takes me a few days to realize that the unique whistling I've started hearing in the neighbourhood is my bright orange friend. I slowly realize that it is indeed the oriole's song, coming back to my winter-weary mind like a long forgotten memory. I've been hearing it lately. I put out some cut oranges for it, but a squirrel promptly absconded with them, so I've just been watching the trees every time I hear that funny whistling, hoping for a glimpse. I've seen a few of the paler, yellow females, but the bright orange males have thus far eluded my sight. Today I was walking along the lake at dusk, as dark clouds slowly rolled in. The beach was mostly empty, and the lake was calm. As I walked, I heard the whistling of the oriole in the trees. All of a sudden, those memories of that forgotten day suddenly returned. Not necessarily with the accompanying sadness, as the immediacy of the memory is long past, but with a faint nostalgia. As I continued walking along the quiet lake, I listened to the oriole's sweet voice carrying across the beach. As was desperately wished for me long ago on that turning point of a day, the oriole was no longer paired with the ache of that day. The two have long since separated. The oriole, without me realizing it, has become almost like a 'power animal' or totem. It has taken on the mythology of brightness out of dark times, of healing from grief, of the simple truth that sadness is not forever. I have not always known that, but as the years have gone by, that truth slowly emerges a little more clearer each time, just like I slowly but eventually realize that the strange whistling I hear every May is the return of the oriole. It doesn't hurt to have reminders. Birds, it seems, are mine. In my family, holidays, birthdays, and general get-togethers don't fit the usual model. We sit around the table for hours on end, and it's not uncommon for everyone to be sitting and doing some form of eating or waiting for food from noon until 8 or 9 at night. Meals are slow, drawn-out affairs. A main course. Then clearing the table, and dishes washed, while more talking happens. Then possibly a seafood course. Another long pause while dishes are cleared and washed. Then, a fruit course. And then finally, coffee, desert, and of course, spirits of various natures. However, eating is not the priority, but rather, story-telling. Conversations all happen simultaneously - it's like having multiple radio stations all on at once, and you can decide where to tune into at any given moment. As a small child, I loved the cacophony of stories all happening around me. While the other children would leave the table to go off and play in between courses, I would linger at the table, silently enthralled by the retelling of days long past. I would listen in fascination as my father and uncle took turns filling in the blanks about all the times back in the small village in Portugal that they snuck into neighbours yards and stole peaches or various other fruits. The elaborate toys and games they would create themselves out of sticks and rocks. The pranks they would play at school. I would delight in the tales of these grown men turned vivid little scamps in my mind's eye, and giggle when they explained how they narrowly escaped getting caught. My grandfather was a master story teller. I did not know him, or any of my grandparents that well, as they all lived back in Portugal. But whenever we would visit, I would revel in his unique story-telling ability. He would draw us in expertly, building up the suspense, painting vivid images of his escapades... and always have the entire table full of people laughing in tears by the end of it. Tonight I was babysitting a pair of young girls, and they wanted to hear stories about real people, not a bed time story from a book. I wondered if they'd be interested in my own adventures. "Did I ever tell you about the time I swam to an island with my friend and almost got attacked by a gigantic bird?" I started off. "Tell us, tell us!" was the reply I got. So I told them. They interrupted with so many questions - how long did it take you to swim? How big was the bird? Why did you and your friend decide to go to an island? Was it far away? When I was done, they wanted more. "Can you tell another one?" they begged. "Then we'll sleep!" So I told them about the time I saw a bear. "A real live bear?! Are you sure it wasn't someone with a puppet?!" "How did you live without a PHONE in that cabin?!" And then when I was done, of course the inevitable... "Please just ONE more!" They couldn't get enough of it. I'm not anywhere near a master storyteller like my grandfather was, but I seemed to have painted some kind of vivid images in their minds. I was fascinated by their interest. Why do real life stories of people we know grip us so? Was I not unique in my childhood then - does every young child have a natural interest in the collective stories of their adults' pasts? Story-telling serves not only the listener, but the story-teller as well. A few months ago, I went to visit a friend after I returned from New Zealand & Fiji, and spent a few hours showing her a hefty selection of my photos and telling all the associated stories. Watching the rarest penguin in the world come out of the ocean after waiting for hours. Seeing steaming vents in the earth and bubbling mud puddles. Hiking for hours to see a 360 degree view of mountains surrounding me. The culture shock of stepping onto a remote Fijian village on a tiny island and having to figure out how to adapt. Flying a plane over the mountains. Making breakfast in the back of a tiny sleepervan in the wind and rain. The morning we woke up to a pink sunrise... and a man with his pony. My friend listened attentively, rapt in my swirl of stories and associated spin-off conversations they inspired. I left her place a few hours later feeling a deep sense of wholeness. It is one thing to go abroad, discover, explore, take it all in. But when we return, we return to our regular lives, and the wealth of the lived experiences remain locked inside us. Story-telling is a way to bring those stories to the surface; to draw others in to the richness of our lived experiences. Story-telling makes us closer, as we get to see and experience aspects of another's life that we would never otherwise have access to. Story-telling is so much more than a few photos shared on social media with a quick comment here and there.